School wasn’t going any better. Marsella had failed all of his classes and was now on academic probation. If only he could go back to that foggy night on his moped months ago. Marsella never thought he would be at UVA in the first place. Growing up, he figured he’d follow the same path as most children from the small town in Rhode Island where he grew up and attend the University of Rhode Island. “That’s just what you did,” Marsella said. But then Marsella got good at running. Really good. As a kid, Marsella had loved football (he played quarterback) and baseball. He thought those would be the sports he played in high school, and, with any luck, could pursue in college. Things changed, however, in the ninth grade. While walking to catch the school bus one day, Marsella suddenly fell to the pavement. He couldn’t move a muscle – he was paralyzed. At the hospital, doctors discovered that the teenager – who had been diagnosed with scoliosis two years earlier – had a tumor on his spine. Through surgery, they were able to remove it; Marsella regained all of his movement. But the doctors had some bad news: Marsella could no longer play sports that involved any aggressive movements. Ever since middle school, when he would race his friends for fun, Marsella had been fast. He joined the track team and quickly made the mile his specialty. “It just became a sport I ended up falling in love with,” Marsella said. As a junior, Marsella got the attention of college track recruiters at a national meet in North Carolina. Immediately after his race, a coach from Duke University offered him a scholarship. Other offers flooded in. Eventually, Marsella, attracted to the training approach of University of North Carolina assistant track and field coach Pete Watson, chose UNC at Chapel Hill. However, when UVA Director of Track and Field Jason Vigilante – who had never recruited Marsella – resigned and Watson joined new director Bryan Fetzer’s staff, Marsella decided to follow Watson to Charlottesville. In the fall of 2012, a 17-year-old Marsella arrived at UVA as Fetzer’s first recruit, a future star of the team. But then came that foggy night. Just starting his second semester, Marsella was driving his moped home from dinner with teammate Adam Visokay when they were struck by a car. Other than sustaining a concussion, Visokay was fine. Marsella wasn’t as fortunate. His skull absorbed so much force that one of his eyeballs was pushed out of the center of its socket. Doctors would later tell Marsella – who had been wearing a helmet – that he sustained the equivalent of 15 concussions. The swelling on Marsella’s brain forced doctors to drill a hole in order to relieve the pressure. Back in Rhode Island, Marsella’s parents – who work as pharmacists – were finishing work when they got the call that their son had been in an accident. It was a bitter déjà vu to their son’s time in the hospital just a few years before. “When my husband came in to tell me, I just kind of went blank,” Kelly Marsella recalled. Kelly insisted on driving and the couple drove straight to Charlottesville. “I just had to have some sense of control over a situation you had no control over,” she said. For a while, the Marsellas didn’t know for sure if their son – who was in a coma for four days – would live. When Mike Marsella woke up, he couldn’t remember anything. “I didn’t know where I was. I didn’t know who I was. I didn’t know what was going on around me,” he said. Marsella’s parents turned their attention from whether their son was going to live to what kind of mental capacity he would have. One day, while in the hospital, Kelly Marsella nearly broke down as she listened to another mother’s story of how her son had been in an accident and everything had turned out just fine. Now he was bagging groceries at a store. Very slowly, Marsella’s cognitive abilities began to return – but he still suffered from short-term memory loss. Every 30 minutes, his brain would reset. Two weeks after the accident, Marsella’s parents tried to explain to him what had happened. One thing Marsella still seemed to have a grasp on was that he was a runner. When Marsella was eventually able to get out of bed, his father began taking him on short walks around the hospital. In the aftermath of the accident, Marsella – who says he never got an apology from the driver – stayed at UVA as a part-time student. His parents didn’t want him to come home when they’d be working all day. They didn’t think he could get better being by himself. Initially, Marsella stayed with his mom in a Charlottesville hotel before UVA – with the help of Associate Dean of Students Aaron Laushway – was able to move him into graduate student housing that was better suited for him than his first-year dorm. Marsella still needed help with a neck brace and getting to classes – so his mother stayed for several weeks. The one bit of good news was that he hadn’t damaged his back. Other than the injury to his head, whiplash, a few lacerations and his eyeball needing to be re-centered, Marsella’s body was OK. Still, the rehab process was grueling. Marsella couldn’t run for a few months because doctors feared the impact of his feet striking the ground would cause more damage. One of the drills Marsella’s physical therapist put him through entailed standing on one foot while doing math problems and turning lights on and off. “It felt like I was relearning life,” Marsella said. That May, just four months after the accident, Marsella thought he was ready to race again. He entered the Virginia Challenge – a meet that featured some of the top college and pro runners in the country. In a field of 57 runners, Marsella finished dead last. Things didn’t get any better over the summer. That fall was the low point. On the track, Marsella was consistently in the back of the pack. In the classroom, he had failed all of his classes and landed on academic probation. He said he felt “slow and dumb” – like he didn’t deserve his scholarship – and thought about returning home to Rhode Island. But a talk with his dad changed his whole outlook. “He said, ‘Do you want to roll over and give up or do you want to give it another go?’” Marsella recalled. Marsella gave it another go – this time with a different attitude. With the help of UVA neuropsychologist Jason Freeman, Marsella stopped letting minor setbacks get him down. He stopped feeling sorry for himself. He stopped wondering if he was ever going to be himself again. Shortly after, everything started to click. In an unexpected way, Marsella – a sociology major – said his classes helped him make sense of everything he had gone through. “Instead of hard facts, they taught me how to think abstractly,” he said. Marsella’s close-knit Italian family was his biggest support system. His teammates and friends proved vital, too. Marsella became more confident. Still, he didn’t know if he would be able to return to even his high school form in which his best time in the mile was 4 minutes, 9 seconds. But then came a meet at the University of Kentucky in January of 2014. Marsella ran a 4:08. From there, he got faster and faster. Ever since Marsella had started running, he had dreamed about running a mile in under 4 minutes. Roger Bannister was the first to do it in 1954. In 2015, competing in an indoor meet at Boston University that was close to where he had grown up, Marsella was determined to join the club. With teammate and good friend Henry Wynne pushing him, Marsella saw a “3” on the clock as he came down the homestretch. As family members, friends and his old high school coach cheered wildly, Marsella stretched across the finish line. Marsella had come up short. Marsella’s time flashed on the big board – 3:59.97. “Everybody just exploded,” Kelly Marsella said. 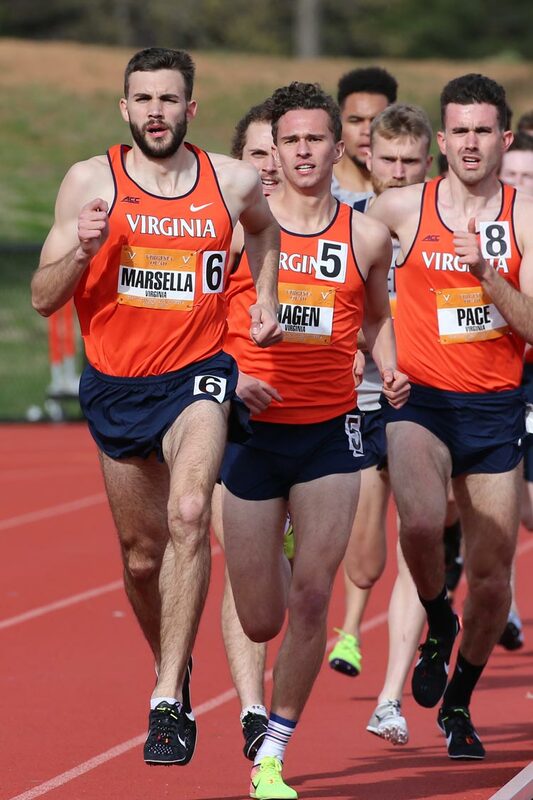 Marsella became just the third runner in UVA history to crack the barrier (less than 500 U.S. track athletes are believed to have accomplished the feat). “I never stopped believing that he had the talent to do it,” he said. Six years after arriving at UVA, Marsella – who was named to the indoor All-ACC Academic Team last Thursday – will be leaving with two degrees after he receives his master’s from the Curry School of Education next month. “It’s been a long, long trip for him,” John Marsella said. “We can’t say enough about the University and Coach Fetzer and Coach Watson and Dean Laushway. They were instrumental in helping us through the tough times. 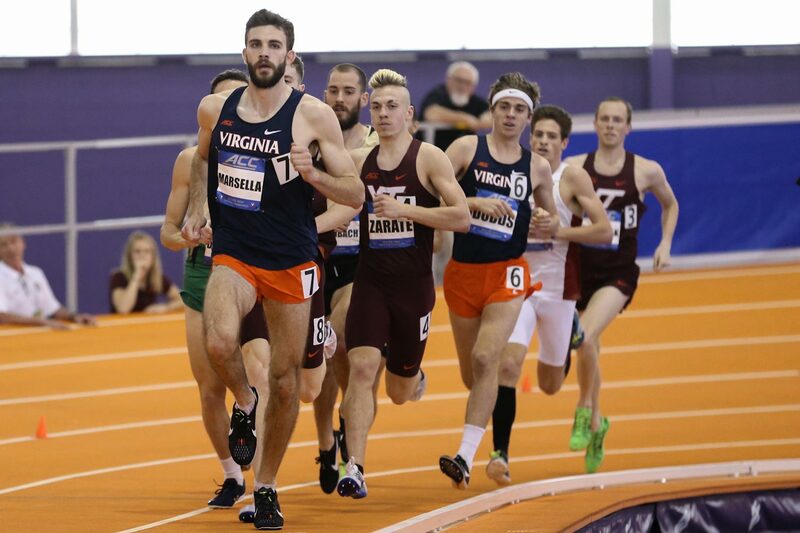 Marsella, who is gearing up for the ACC and NCAA championships, plans on pursuing a professional running career after UVA. Someday, he thinks he might go into coaching. As crazy as it may sound, Marsella doesn’t view the things that have happened to him in life as bad luck. “I actually twist it around and say that it’s good luck that I’ve had – that I’m still able to keep doing what I want to do,” he said.